On Veterans Day, we would like to spotlight Cavalier’s Tim Duffey, our Merchandiser in Ft. Wayne, Indiana, who served as a member of the United States Marine Corps for six years. During his tenure, he became a scout sniper with the 1/24 Station in Harrison Township, Michigan. 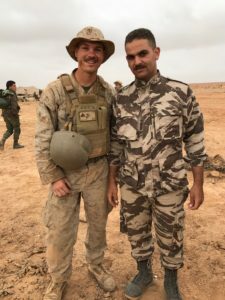 Tim had the opportunity to work with militaries from different parts of the world during his two deployments and developed friendships he could have never imagined having. Best and most difficult parts of being in the service? I believe the best part is the camaraderie. The friendships you build are like no other. You learn more about the people you work with than their own families do. Another thing I still enjoy to this day is hearing back from guys I’ve trained who are putting what they’ve learned from me to use. The military is a love-hate relationship. Between the long weeks where you might get an hour or two of sleep each day, to the coldest days you never want to think back on. Spending every day in another country can be tough, so you always have to appreciate everything you can when you’re home. As much as I hated a lot of those days during my six years of service, I sure did make a ton of amazing memories I’ll always look back on and smile. Proudest moment: All the hard work and suffering I put into becoming a scout sniper. I don’t think there’s anything in this world that could challenge me as much as that process did. What do you like about the craft beer business: The best thing about being in the craft beer industry is the constant opportunity to talk to people about craft beer. When it’s your passion you definitely look forward to every day, meeting new people, learning something new and even getting that chance to educate someone. Favorite beer: Not only does Cavalier have tons of amazing brands but it gets tough to pick just one beer when asked for your favorite. I would have to say Stone Xocoveza since I’m a huge stout fan. My everyday go-to beer would be Founders All Day. To all our Veterans, and especially those at Cavalier, thank you for your service.